The first time you step into a room, you notice its colors; proper color use makes certain decor elements stand out, while others seem to blend into the background. Contrasting colors helps you take notice of the items that stand out, as in the contrast of deep and dark crimson red against a pale buttery yellow. In color theory, you can contrast colors from several different perspectives: light against dark, or cold colors against warm colors. In addition, you can create complementary contrast by pairing opposites on the color wheel. 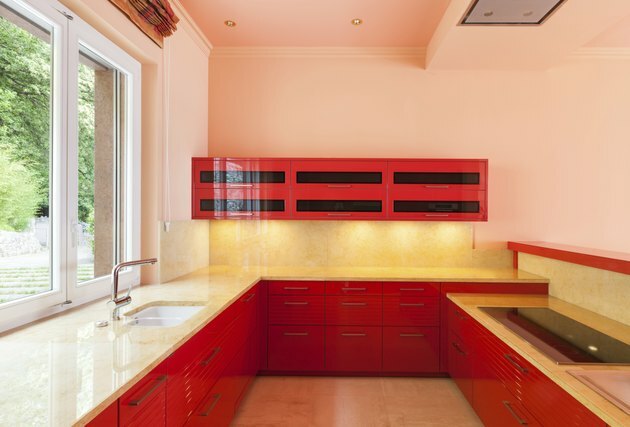 A monochromatic pairing of red with light pink creates contrast. On a standard color wheel, there are 12 colors: three primary, three secondary and six tertiary colors. Create secondary colors by mixing two primary colors, while tertiary colors involve mixing a primary and secondary color. To create black, mix all three primaries together. To lighten or tint colors, add white. To tone or mute a color, add gray, and to shade a color, add black. You can also reduce the intensity or brightness of a color by mixing it with its opposite color on the wheel. Equal amounts of a contrasted color in a room create too much tension, so don't overuse the brighter color of the two. Nature paints with color better than any artist, so let it teach you color pairings that work, such as the deep velvety burgundy and the pink in the mountain laurel, which features burgundy red flowers, pink centers and a touch of white around its edges. For a girl's room, paint walls a pale pink and add touches of burgundy and white for contrast. If both colors have equal intensity, green and red may look too much like a holiday color pairing than a color scheme that you can live with year round. Instead, create pleasing contrast by adding a bit of yellow to the green to warm it up, and a touch of blue to the red to cool it down. Paint a focal wall with a cool red, and add throws and pillows in a yellow-lime green to a taupe couch to create an agreeable contrast. A trendy contrast pairs light turquoise or sky-blue walls with orange-salmon red chairs and cabinets. A contemporary color scheme might include walls painted in gray, with furnishings in white and deep mahogany red decor touches or black furniture against white walls and touches of red in throws, pillows, vases or lamp bases. Pale lilac walls pitted against an antique Victorian mahogany red couch pits light against dark and cool against warm for gratifying contrast. Besides pairing light colors with dark, or warm ones with cool ones, you can create high contrast in your home by pairing rough textures with smooth ones, expensive items with thrift-store finds, organic objects with manufactured ones and elegance with a bit of shabby chic. The idea behind creating contrast can start with colors, a tawny, lion's mane-colored chair with a ruby-red throw because the opposites of light and dark create contrast that more than defines the space.